Supernatural horror film fans, here is your chance to be among the first in Cleveland, Ohio to see The Curse of La Llorona on Tuesday, April 16, 2019 at 7:00 PM at Cinemark At Valley View & XD in Valley View, Ohio! For your chance to get a pass, please log on to http://wbtickets.com/ and enter the following code: HHTCOLL238. This pass is valid for up to two seats. Seating is first-come, first-served and is not guaranteed. You must be with your guest to enter. Saving seats for other parties is prohibited. 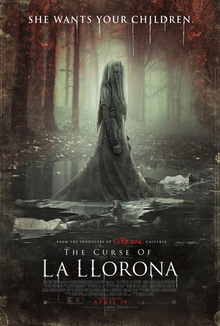 In The Curse of La Llorona, Anna Garcia, a social worker and widow raising her two children in 1970s Los Angeles, is called to check in on one of her cases and then finds signs of foul play. As she digs deeper, she finds striking similarities between the case and the terrifying supernatural occurrences haunting her family. Enlisting the help of a local faith healer, she discovers that La Llorona has latched herself onto Anna and will stop at nothing to take her children. La Llorona, also known as the Weeping Woman, is a female ghost in Latin American folklore who lost her children and causes misfortune to those nearby. As she searches for them, she takes other lost children, making them her own. Anna turns to mysticism with the help of a disillusioned priest to fight the evil entity. Directed by Michael Chaves, The Curse of La Llorona stars Linda Cardellini as Anna Tate-Garcia, Raymond Cruz as Rafael Olvera, and Patricia Velásquez as Patricia Alvarez. The film is scheduled to be theatrically released in the United States on April 19, 2019 by Warner Bros. Pictures and New Line Cinema. Questions for students: Are you planning on seeing The Curse of La Llorona? Please let us know in the comments section below this article. Acevedo, Rose and Pat Anderson. The Real Story of La Llorona (Strange Texas Tales That Never Die) (Volume 5). Overlooked Books, 2014. Hayes, Joe. La Llorona / The Weeping Woman (English and Spanish Edition). Cinco Puntos Press, 2004. The featured image in this article, a scaled-down, low-resolution image of poster for the film The Curse of La Llorona, qualifies as fair use under the copyright law of the United States. Next Article April 9, 1948: Freedom Fighter or Terrorist?